At this week's Computerworld Premier 100 conference in Tucson, I asked many of the IT leaders whether their companies will use the coming BlackBerry Z10 smartphone or its qwerty cousin, the Q10. I had done a review of the Z10 and found the underlying BlackBerry 10 OS to be very good. Based on my experience, I thought there might be some genuine interest. What I found is that nobody, out of about 20 CIOs and senior VP's of IT, that I spoke to said they would be endorsing or adopting the platform, except for one CIO who pulled out his current BlackBerry and said, "I only use BlackBerry because my boss wants us to." He suggested his boss might require continuing with BlackBerry 10 and the Z10. At a luncheon during the P100 event, I also asked a group of eight CIOs at my table if anybody was moving to the new BlackBerry device, and everybody but the current BlackBerry user shook his head "no" and some even grunted, almost in disgust. They indicated that it was the BlackBerry outage in the fall of 2011, and the company's slow rollout of its latest OS and devices that had been their biggest concerns. One of the CIO's cornered me later and said that it didn't matter if the new OS was terrific and had great security for IT with the new BlackBerry Enterprise Service 10 server behind the firewall supporting the dual personality concept called Balance. "All that doesn't matter if the users buy something else as their phone," he said. So, in a Bring Your Own Device world, the users get to decide what works, according to this one CIO, and apparently they want the lastest iPhone or a great Android phone like the Samsung Galaxy S III. BlackBerry just hasn't had a new device for the users to consider. When several U.S. carriers begin selling the Z10, probably by the end of next week, it might be too late for users to give the former smartphone giant another chance. 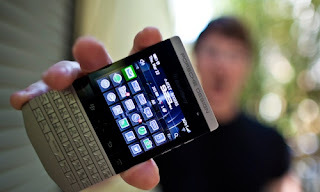 Maybe the experience will be better in Europe and elsewhere outside of the U.S. On Wednesday, BlackBerry said it "continued to build momentum for the BB10 platform" with the decision by UK-based Birmingham and Solihull Mental Health Foundation Trust to deploy1,800 Z10's in 2013. When several big U.S. organizations do the same thing, my ears will perk up. And when Sprint confirmed a week ago that it won't carry the Z10 and just the Q10, I wondered if Sprint was onto something about how U.S. buyers feel. BlackBerry has always appealed to IT managers for the high degree of security the platform offers, but has seemingly failed to realize that buyers--users--are really in control in many corporations. At P100, one CIO told me, "We battled the users over BYOD and the users won." Each time BlackBerry has tried to appeal to those consumers, it seems to have botched the job with its marketing. The recent BlackBerry SuperBowl ad that was designed to raise awareness for BlackBerry fizzled, at least for me. Brand awareness campaigns need to at least be memorable, since they aren't by nature highly specific. Samsung could offer a lesson to BlackBerry. At Mobile World Congress, Samsung advanced its SAFE concept for smartphone security with what it calls Knox, offering 500 security and management API's that can work with Samsung Android devices and several third party enterprise mobile device management products. What Samsung has shown the market is a willingness to offer an array of sizes and styles of smartphones and tablets, while also beefing up underlying security and management. The Z10 really could catch on outside of the U.S., and richly deserves a chance in the states. My unscientific and limited research at the P100, however, shows it will face a battle to gain user mojo (Computer World).